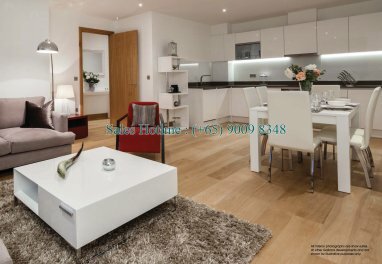 Marine Wharf East is Galliard Homes’ latest major luxury development south of the River Thames and it is one of their most innovative project to date. Theatreland, Leicester Square, Soho, the South Bank - so many names and places synonymous with the Capital and all so deceptively close to Marine Wharf East. Residents can literally cross the Capital in minutes, whether shopping in Surrey Quays or Selfridges on Oxford Street, whether dining at the local or al-fresco style at the Oxo Tower, overlooking The City - it's simplicity, convenient and connected. The East London line connects Surrey Quays travelling north to Wapping, Shadwell (and the DLR) and within one further stop Whitechapel – a new Crossrail interchange 9 minutes direct from Surrey Quays. From Whitechapel lie the fabulously trendy districts of Shoreditch and Hoxton. The nearest mainline rail services are at London Bridge – one of the most well connected and fourth largest transport hub in the Capital, with a brand new concourse linking tube, rail, bus and Thameslink services. London Bridge mainline also serves London Gatwick Airport. 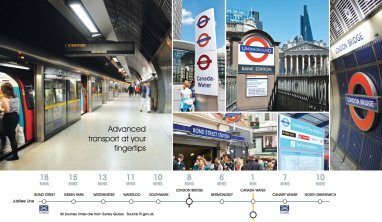 Residents will join London’s tube network at Canada Water, with the Jubilee Line providing over 36 kilometres of fast track connections to all tube lines and strategic locations from Stratford to Swiss Cottage. The Northern line connects at London Bridge with a 1 minute service to Bank in the heart of The City. Residents will be around 20 minutes travel time to London City Airport – with direct flights to over 30 European destinations and an international service to New York JFK. 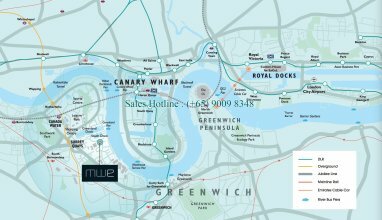 London Heathrow and London Gatwick are both within 50 minutes of Marine Wharf East. 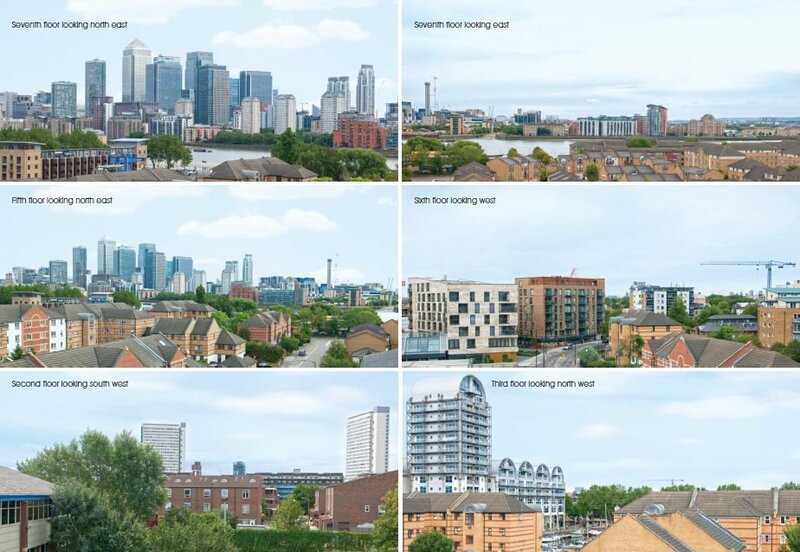 The DLR is currently the Capital’s most advanced and automated transport network with connections at nearby Shadwell (11 mins) or Canary Wharf (7 mins), linking the City to Stratford, London City Airport and Greenwich south of the river. The DLR will also have 3 Crossrail interchanges scheduled for service in 2018. Thames Clippers operate a commuter service from embankment to Canary Wharf, Greenwich, the O2 Arena and Woolwich Arsenal Pier. Residents will be around 5 minutes walk from this highly efficient service which stops at Greenland Pier on the eastern end of Greenland Dock. Marine Wharf East @ Surrey Quays SE 16 provides an outstanding example of Docklands regeneration and massive inward investment. From former derelict docks to a colourful fusion of contemporary architecture, parkland and bustling activity centred around its two principal expanses of open water – Greenland Dock and South Dock, now a cosmopolitan marina and the largest in London. 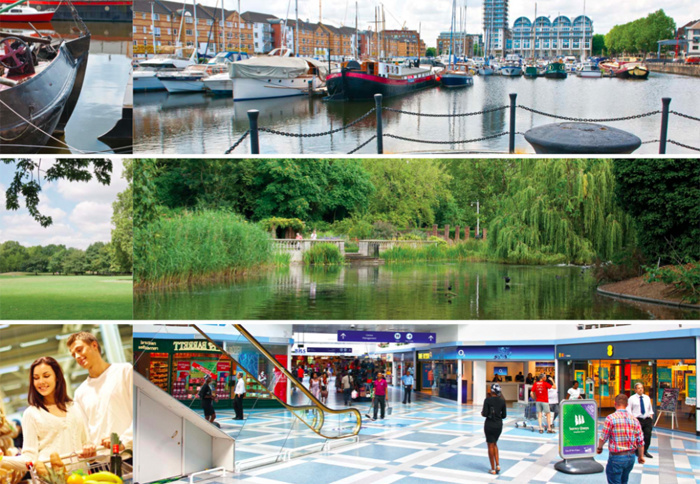 A short walk from the apartments lies Surrey Quays Shopping Centre with over 40 stores and a food court, and directly opposite, Southwark Park – 63 acres of wooded parkland, wildlife gardens, boating lake, art gallery and numerous sports facilities. Continuing outdoor pursuits, residents will be just a few minutes walk from the River Thames itself – and its winding path that follows the River from Hampton Court Palace to the Thames Barrier – a 40 mile stretch of the Thames Path (a UK national trail) passing minutes from the development. Residents at Marine Wharf East will be a stone’s throw from transport, shopping, water sports, traditional inns and constant reminders of the nautical legacy of Surrey Quays. Rustic oak 3 strip engineered timber flooring to living/dining, kitchen and hall areas. Fully integrated SMEG appliances to include washer/dryer* & dishwasher, fridge/freezer, stainless steel oven, ceramic hob, microwave oven. Freestanding where located in services cupboard. High gloss white unit doors with handleless design. Mid brown re-constituted stone worktops and upstands. Stainless steel 1½ bowl inset sink with single lever monobloc tap. 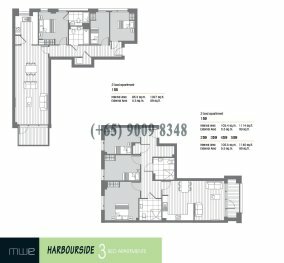 Marine Wharf East provides a range of 1, 2 and 3 bedroom apartments. 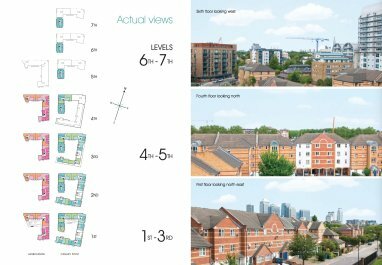 Set around beautiful landscaped grounds, the site will incorporate approximately 1,800 square metres of public open space, just one minute away from the River Thames Path Walk. 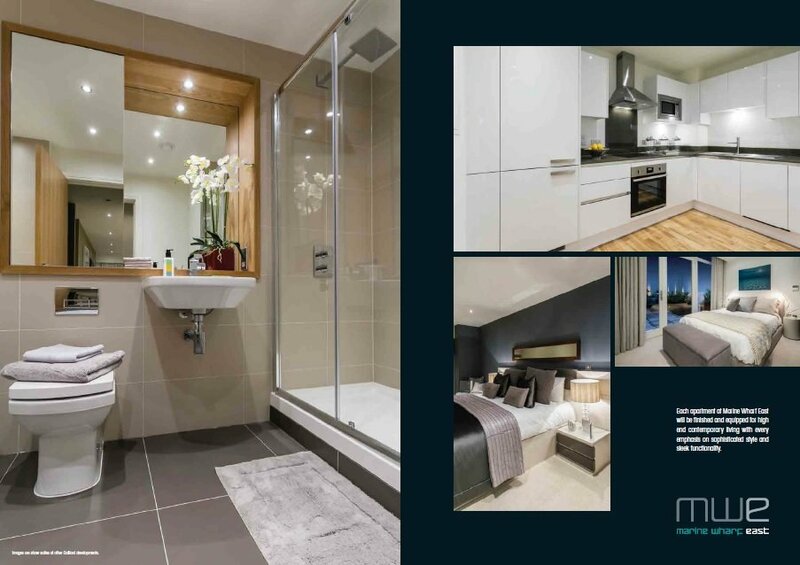 Marine Wharf East comprises two principal blocks, Canary Point and Harbourside, each with a residents’ lift serving all levels including lower ground parking. 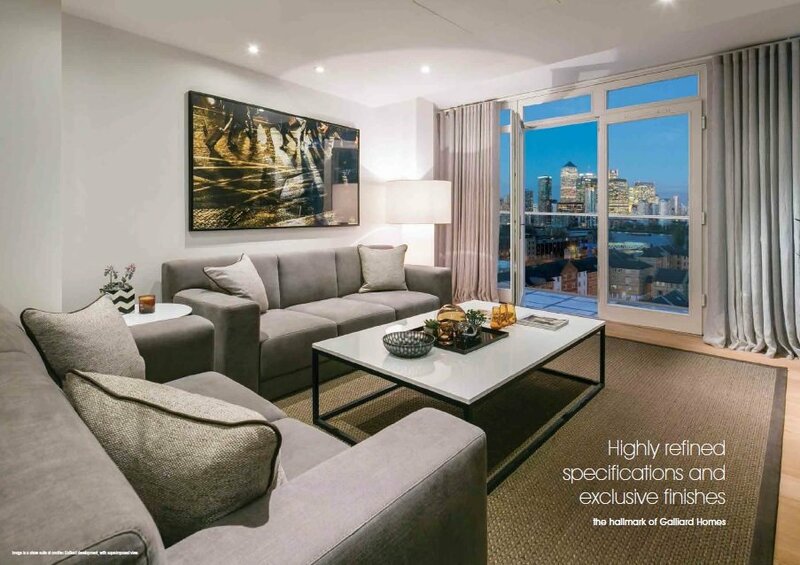 Professionally designed to maximise on natural light, all apartments comes with a private balcony, with selected apartments in Canary Point enjoying expansive terrace space and many residences boasting panoramic views towards Canary Wharf, The River Thames and South Dock Marina. Marine Wharf East is the exciting new vibrant destination for London’s Dockside. 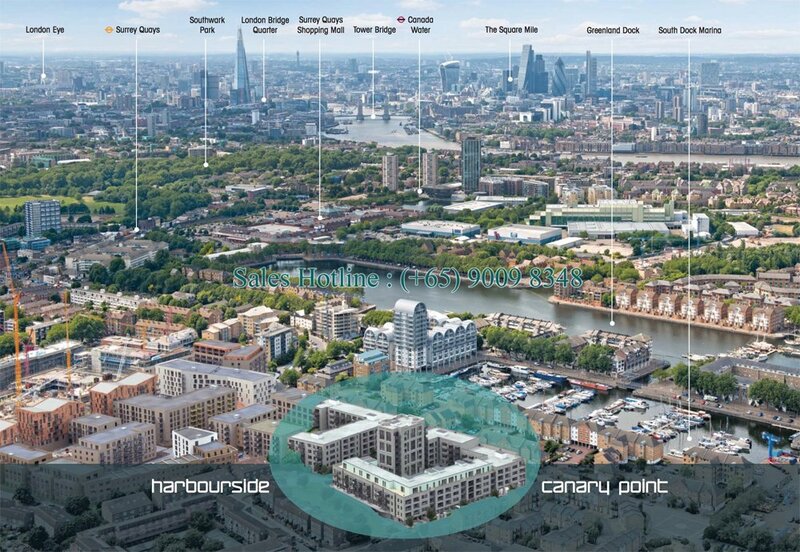 Fantastically located only minutes from Canada Water and Surrey Quays stations, residents benefit from easy access to Canary Wharf, London Bridge and beyond. 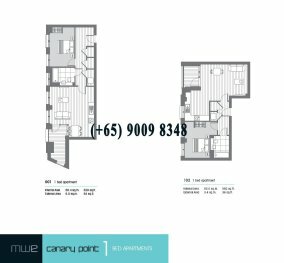 Marine Wharf East comprises two principal apartment buildings – Canary Point, the larger, offering 97 luxurious 1, 2 & 3 bedroom apartments, and Harbourside, with 66 similar luxury apartments with private balcony or terrace. 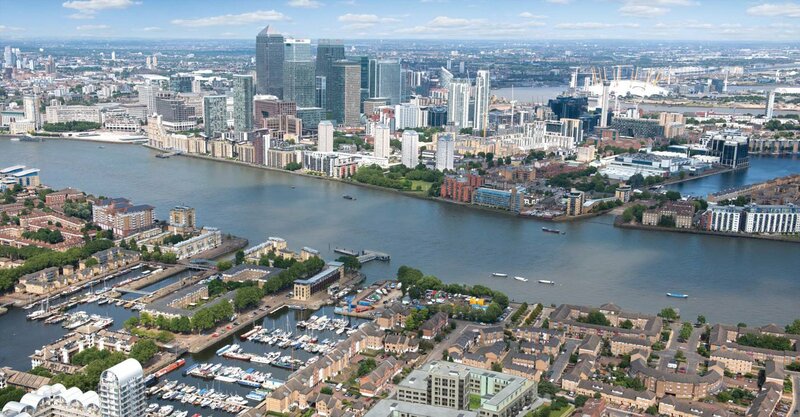 Many apartments will benefit from panoramic views of Canary Wharf, the River Thames and South Dock Marina. 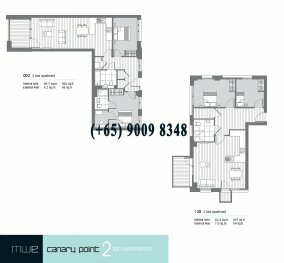 The apartments are arranged from lower ground to seventh floor in Canary Point and ground to fourth level in Harbourside. 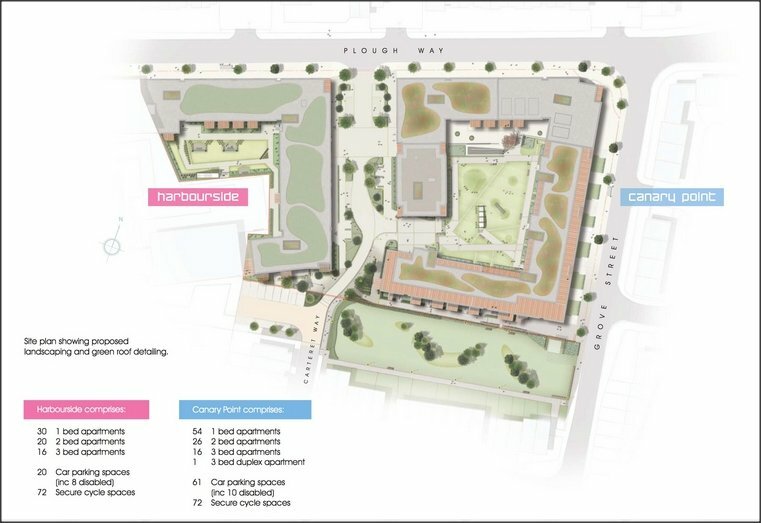 The development will also provide secure lower ground car parking within each block. 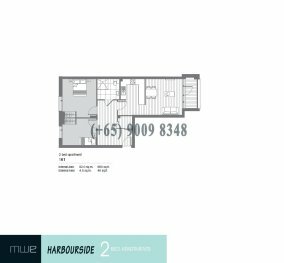 Booking Fee of £2,000 payable to developer's account. Within 21 days from reservation, pay 10% of purchase price (less booking fee) and exchange contract. 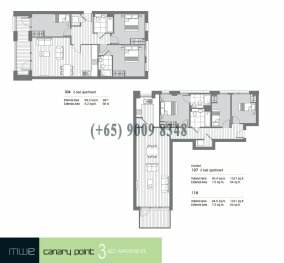 Within 6 months from exchange of contract, pay 10% of purchase price. 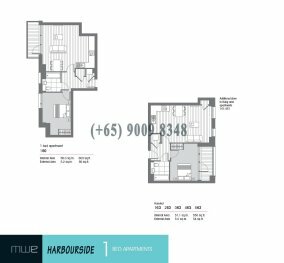 Balance 80% of purchase price is payable upon completion.